The Pululahua reserve is located 30 minutes North from Quito. The reserve covers 3383 hectare, protected by the state. The reserve was an active volcano in the past, and has a crater created due to its volcanic activity. The volcanic crater is very fertile and hence has developed grasslands and cultivated landscape. Numerous trails with the beauty of nature infused with enormous species of birds and flowers can be found here. The reserve is home to some of the most astonishingly beautiful orchids and other plants. The forest trails are an ideal location for bird-watching. Apart from bird-watching, hiking and mountain biking are two main activities undertaken on the reserve. Many guided tour operations are also undertaken in the reserve. Entry fees: There are no particular entry fees for entering the reserve. You will have to register at the window near the entry before entering. Timings: No specific timings for visiting this reserve. However it is advisable to reach early in the morning to view the spectacular fog clouds that cover the crater. 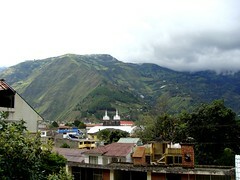 Location: 30 minutes, North from Quito"